Apple gets more than its fair share of stick for supposedly not being innovative enough these days, but that wasn’t what everyone was saying when the iPhone was first announced in 2007. Offering what, at the time, was the holy grail of mobile telecommunications in something the size of a smartphone, the iPhone was a truly revolutionary device. 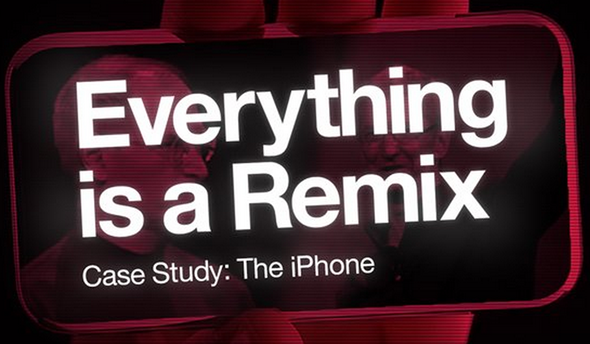 Filmmaker Kirby Ferguson has been running an ‘Everything is a Remix’ series for a while and the artist has released a new case study based on the iPhone in which he looks into whether the device was truly a huge leap or simply a remix of devices and technologies that were either already available, or being worked on by other technology companies. Ferguson points to the multi-touch technology that Apple claims to have created, pointing out that it was already being developed by more than one company independently of what Apple was working to create. While happy to give Apple credit for coming up with a device that was then copied en-masse by an industry desperately trying to play catch-up, Ferguson then turns his attention to the release of iOS 7 – a software update that was arguably heavily influenced by things like Windows Phone and the iPhone’s main competition, Android. The gist of Ferguson’s argument is obviously that everything is eventually remixed and that nothing truly new is ever created, which not only sounds like a depressing notions to us, but also one that kind of misses the point somewhat. Still, the guy knows how to make a good video and if you’ve a spare ten minutes, some of his work is well worth the time to watch. Especially this iPhone-flavored one. Apple famously announced the iPhone back in 2007 and the competition has spend the six years since doing its best to catch up with the Cupertino firm. With a smartphone market that has ballooned in the last six years, Apple could perhaps be given the credit for giving us the options that we have today.